← Michigan vs. App State Recap: We Can Run The Ball? I ended up leaving the game earlier than I can remember leaving any game. As soon as Devin Funchess got hurt with 9:45 left in the fourth quarter, I got up, turned to my dad and said, “I’ve had enough” and we walked out. The worst feeling of it all was knowing that was the last game that Michigan would play Notre Dame. No chance at redemption next year. This was the single worst football game I’ve ever watched. Let me clarify. It was the single worst total team effort given the talent they have that I’ve ever seen. Losing to Ohio State in 2006 was far more upsetting. Appalachian State was more horrifying, stunning and sickening. Losing to Toledo in the Big House was just as brutal, but at least that was a really bad Michigan team. The worst part of all of this is the coach speak and coach shtick that won’t go away. Michigan will light up Miami (OH) by 35 points this weekend and everyone will be happy and act like the last game didn’t happen. Like you didn’t get throttled by Notre Dame in the last game you will ever face them in. There’s no chance for redemption. 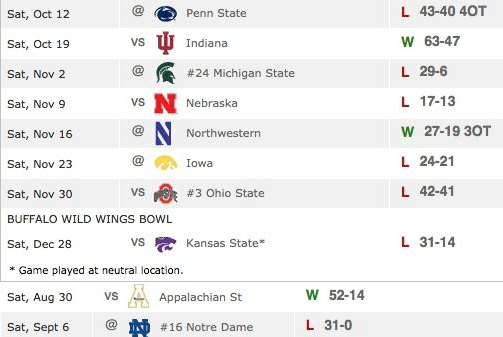 Michigan may have won 4 out of 6, but Notre Dame won 2 out of the last 3 and the last game broke a 30 year streak of not getting shut out and was the worst loss to Notre Dame since something like 1978. I didn’t like the Brady Hoke hire when it was made. You can ask my roommates about that one. But then he had his press conference, he hired Greg Mattison and he won a Sugar Bowl. I bought in 100%. Now I’m second guessing the program again and wondering if my initial feeling was right. If Brady Hoke was in over his head. This most recent loss proves to me that this program is trending downwards and that the lack of developing of talent is more prevalent than ever. There is no reason for this many four and five star players to not get better. Players get worse each year that they are here, save for a few. 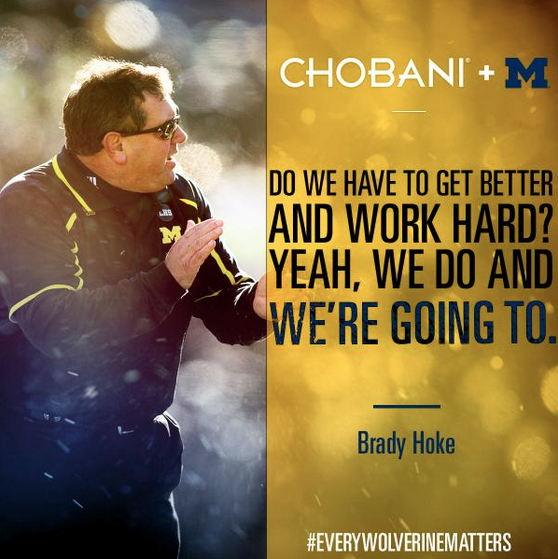 I want Brady Hoke to succeed. I really do. He is genuinely a very nice person and says and does all the right things. He loves Michigan and would never leave for another job. I just don’t know if he’s the right guy for the job any more. The whole ride home I had a migraine. I couldn’t shake the feeling that this season was over. I’m even less optimistic and excited for the rest of the year than before. If you lose that badly to Notre Dame, how many other teams will you lose to? Brady Hoke clearly cannot coach on the road. Every year his teams are unprepared. So how can this team beat Michigan State or Ohio State? People want Hoke to wear a headset, but why do you want a cheerleader wearing a headset? I’m okay with encouragement. Encouragement over yelling will usually get the job done…usually. But what I’m not okay with is the fact that the team play isn’t improving. I’m not okay with the fact that he seems to only clap on the sideline. I’m not saying I want him screaming at kids, but some anger when your team is sucking would be nice. He says the preparation leading up to the game last week was "awesome." Need to execute better. "Excited" where his team is at. Hoke: "Where this team’s at, I’m excited about it. we understand our goals are still out there." Hoke: We didn't play well enough in the red zone. When did Michigan get to the red zone? Hoke on fans: "If they're truly fans, they'll believe in these kids and the hard work they've put in. If they're not, they won't." This kind of quote drives me nuts. My faith has nothing to do with the kids. It’s the coaches. Why aren’t the kids better prepared? Why aren’t the kids developed into better players? Why does Devin Gardner make the same mistakes as last year? Why does Devin Gardner continue to panic in the pocket? Why is the offensive line still brutal (little more obvious to answer, but still)? These are all on the coaching staff. Yes, it is only Gardner’s second game with Nussmeier as the offensive coordinator. Yes, the kids have to execute. But it would help if the coaches prepared them for games. Why weren’t they throwing the ball to Devin Funchess almost every down playing against a corner physically incapable of covering him? Obviously young players take time to develop, especially the offensive lineman. But why is it that Kyle Kalis is getting beaten out by a walk-on? Why isn’t Dymonte Thomas able to start at strong safety? Yes, I know it’s not all the coaches fault. Not every player develops properly and plenty of guys peak early. But no team should be this stocked full of young talent with nothing to show for it. The coaches do a great job of recruiting and are always good about taking ownership, but it’s tiring for them to say the same thing after every game. How about some results? I feel like all that I’m left with after the game is more questions than before. This is atrocious. You can say all the right things, but 3-7 in your last ten games is truly unacceptable. Remember when all of you wanted Denard Robinson to leave so that Michigan could have a “real QB” and a “real offense”? Yeah, good call. Jake Ryan: "Fans don't see what we do in Schembechler Hall, they don't know what we do behind the scenes or how much work we've put in." Keep in mind, I’m not doubting the effort. I’m not sitting here assuming these guys do nothing all week and just hang out. I’m sure they’re all working very hard, coaches included. The problem is that it isn’t working and it isn’t producing results. The program is getting worse. It seems time to accept the fact that Michigan is a mediocre football program. Elite programs don’t go 3-7 against those teams. Michigan may still have its goal of winning the Big Ten intact, but with two games against Michigan State and Ohio State on the road, I’m not sure how they win the Big Ten. Hoke mentioned that some in the media "go through the tape and play coach." So? Why is this a problem? Why does he care what other people do? Perhaps he should go through film some time and learn a thing or two. Hoke: "I think we've got as good a conference as anybody in this country, and I think that will show at the end of the year." Is this why he still thinks the Big Ten is a legit conference? Or is he just being a company guy and not speaking out against everyone? I don’t have a cookie cutter solution. 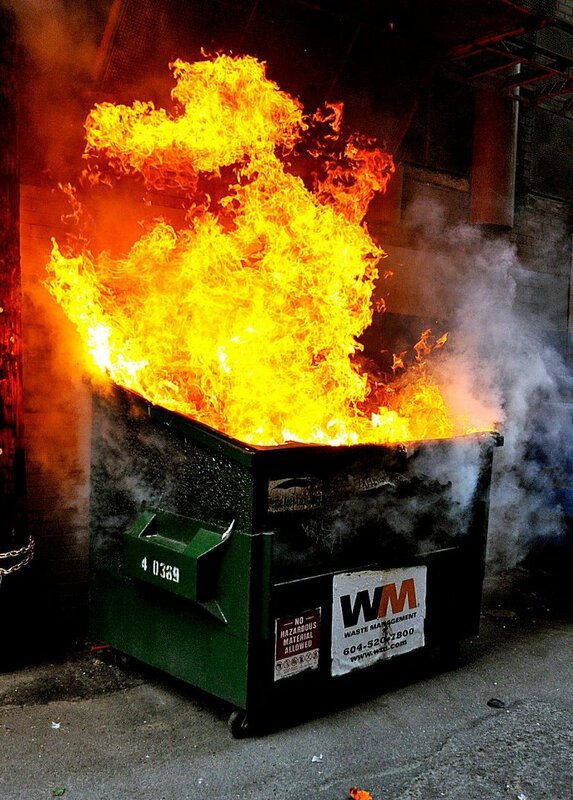 I don’t think that hiring Jim Harbaugh is realistic, not unless Dave Brandon is gone. Both of them are control freaks and would clash. I think the most realistic option for Brady to hire some new position coaches, specifically at offensive line. Even then, changes and improvements aren’t guaranteed. It’s tough to be patient when Michigan hasn’t won a Big Ten Championship since 2004. I personally am tired of the duo of Dave Brandon and Brady Hoke. But I don’t think that it’s going anywhere any time soon. Brandon continues to hike up prices and cares more about getting new customers than keeping old ones. A 10-year waiting list for ticket evaporated over night and now they can’t even sell out every game. It’s disgusting. He stands by Brady Hoke and I truly believe that Brady won’t get fired under his watch, no matter what. Brandon won’t want to admit he’s made a mistake. Plus, he likes to be able to watch film with the coaches and a new coach probably won’t allow that. Who needs season ticket holders when you have Chobani? I understand that money is the lifeblood of an Athletic Department and that football has to cover other sports, but at some point enough is enough. Your fans aren’t made of money and shouldn’t be treated like consumers or customers. Not unless you’re willing to improve the product that you’re offering them. I’m no genius, but raising prices and offering up a worse product on the field isn’t a good way to make money and keep people in the seats. The students spoke with not ordering tickets, that’s the future of your fan base and it’s non-existent. It’s time for a change, I’m not sure what else to expect or say at this point other than more disappointment. What I do know is that I’ll still keep showing up to the Big House, hoping for something to get excited about. This entry was posted in College Football and tagged Brady Hoke, Dave Brandon, Devin Gardner, Doug Nussmeier, Greg Mattison, Michigan Football, Notre Dame. Bookmark the permalink.